Look at the goodies I received in the mail today! Maya, Combustion and Cleaner XL. 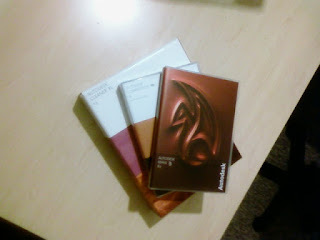 I ordered Maya student version and received the other software free with it. Awesome huh? I thought you would agree. I have been browsing around the campus at AM and watching videos there. Very cool stuff. I like the way they have it setup. They also have lots of stuff for me to do. I am ready for the Q&A session and to start ANIMATING!!!! !